What better way to reward a vigorous effort on the trail—or up a summit—than by sitting back and soaking up the serenity of one of nature’s most beautiful shows? Fortunately, Knoxville has plenty of gorgeous sunset hikes right in its backyard. Whether you’re sticking close to town or venturing further afield, Knoxville is the perfect launching point for your next memorable stroll in the woods. Here are seven recommended sunset hikes in and around Knoxville that are sure to take your breath away. Probably the best view of the city and well worth the trip. This historical landmark in South Knoxville boasts excellent views of the city and is known for its picturesque sunsets. Once the site of Fort Higley, a Union camp constructed in 1863, High Ground Park is bordered today by hardwood forests, native flowering bushes, and a stone wall. To catch the sunset, park in the dirt lot at 1121 Cherokee Trail and follow the gravel trail as it winds its way into the River Bluff Wildlife Area. Hang a right at the first fork, and take your pick at the second fork—either way, will bring you to the overlook and the park’s famous swing. The golden hour light here is phenomenal, and the sunset isn’t bad, either. Another close-to-home sunset hike, Sharp’s Ridge offers a panoramic view of the Knoxville skyline, with the postcard-worthy gradient of the Great Smokies in the background. The 111-acre park is just 10 minutes from downtown, and while you can drive to the top of the ridge or the overlook (the sunset, as viewed from this observation deck, is considered among the most beautiful in America), there’s plenty of hiking to be had, too. If you plan to hike for your sunset, head to Sharp’s Ridge in the fall when the leaves have dropped and the mountains are visible from the three-mile multi-use trail below. Beautiful sunset seen atop Clingmans Dome. 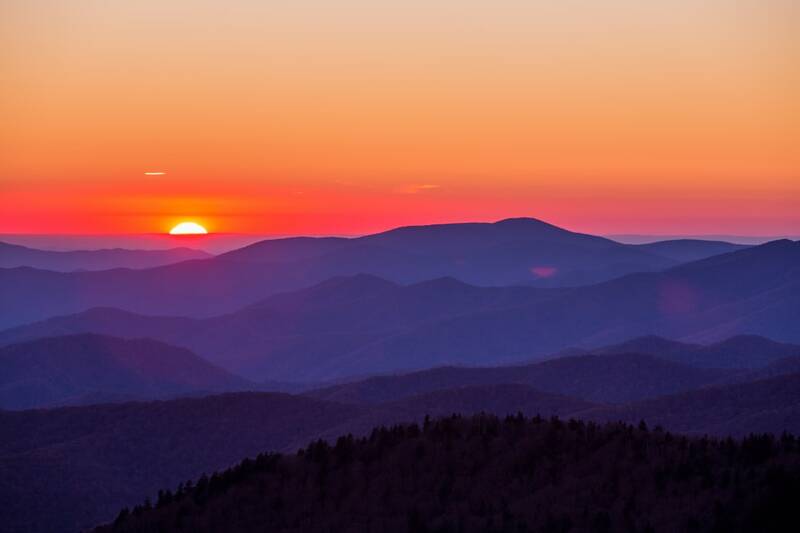 At 6,643 feet, Clingmans Dome is the highest point in Tennessee, so you know it’s a great place to catch the sunset. On clear days, the 360-degree views go as far as 100 miles, and sunsets here are breathtaking. 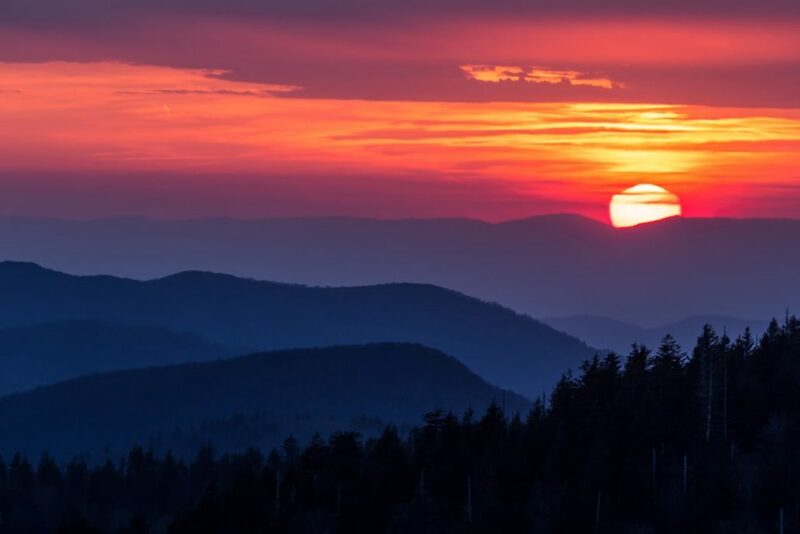 The summit is accessible via a steep paved trail, but the Appalachian Trail also crosses Clingmans Dome, so hikers looking for a challenge can watch the sunset, then head to one of the nearby backcountry shelters. The dome is also the western terminus of the 1,150-mile Mountains-to-Sea Trail, so the possibilities for pre-sunset hikes are nearly limitless. 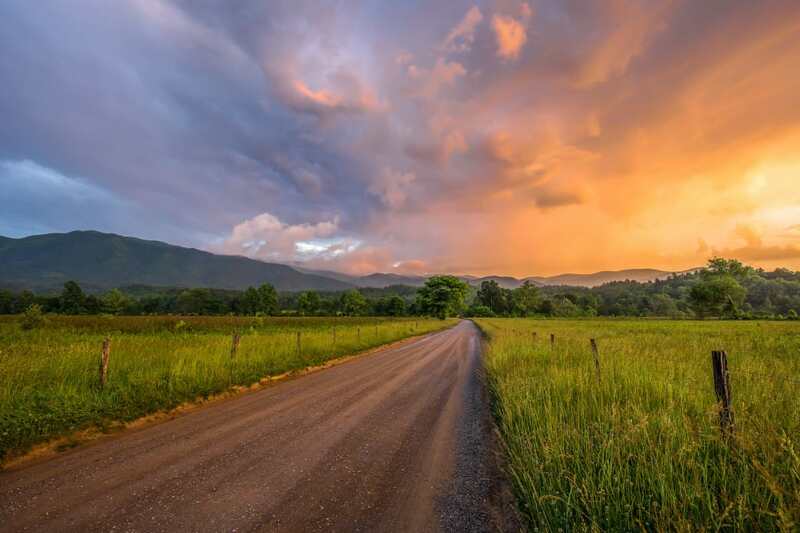 Cades Cove is an excellent place to watch the sunset, either from your campsite or from the summit of Rocky Top (of Tennessee state song fame). A longtime Cherokee hunting ground, Cades Cove is one of Great Smoky Mountains National Park’s most worthy sights. An 11-mile, one-way loop road circumnavigates the entire cove; bikes are allowed on the road, as well. Several hikes begin at trailheads along the Cades Cove loop, including the five-mile roundtrip hike to Abrams Falls, as well as hikes to Thunderhead Mountain and Rocky Top (14 miles roundtrip to tag both summits), both of which offer fantastic sunset views. With its dramatic sandstone bluffs, the highest concentration of natural arches and bridges in the eastern United States, gorgeous views of the Cumberland Plateau, and access to the Big South Fork River, it’s no wonder Big South Fork NRRA sees well over half a million visitors each year. Just an hour north of Knoxville, Big South Fork is home to more than 180 miles of trails for hiking and trail running, plus another 35 miles of mountain bike trails. Plan to explore during the day, then drive, bike, or walk to the East Rim Overlook, where it’s a short hike to a stunning sunset vista. Cherohala Skyway offers access to incredible sunset hikes. 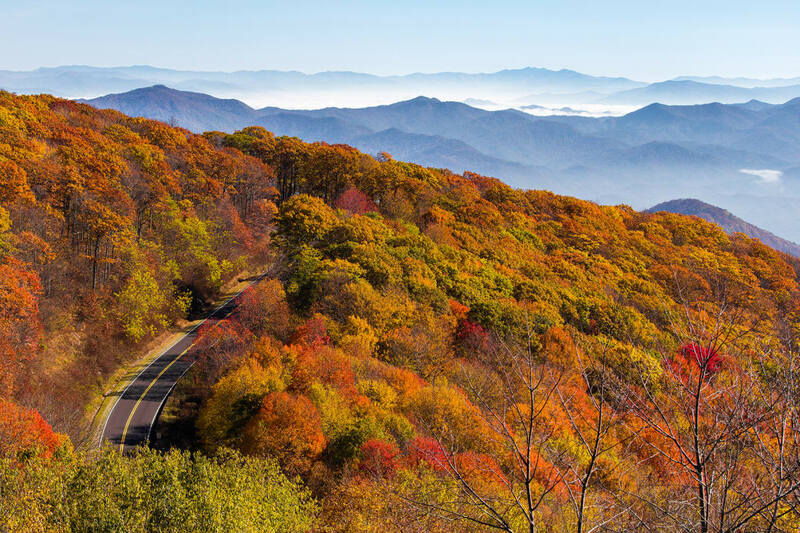 A combination of the names of the two national forests it passes through, Cherokee and Nantahala, the Cherohala Skyway is about 40 miles long and provides access to excellent hiking—not to mention gorgeous sunset vistas. The remote Big Frog Mountain Wilderness clocks in at just under 8,400 acres and include 35 miles of backcountry trails, including several that lead to the summit of Big Frog Mountain itself. The views from Big Frog are spectacular, especially at sunset, and can be reached via the Wolf Ridge, Hemp Top, and Licklog Ridge trails. But don’t get too taken by the unforgettable vistas: This area has tons of black bears, so travel in groups and talk as you head back to the car from your hike after dark to avoid startling one. Less than 40 minutes north of Knoxville, Big Ridge State Park is tucked in the Cumberland Mountains and features 15 miles of forested trails. The Loyston Overlook Trail is short but steep and leads to a lookout above Norris Lake, which now covers the former site of the town of Loyston. The well-marked trails here mean it’s easy to find your way back to the car once the sun has set. But it’s not for the faint of heart—thanks to the park’s haunted history (it’s all in good fun), you’ll want to travel in a group at dusk. 5 Dog-Friendly Carolina Cities Worth a Visit What tha Frugal?